High Beeches lies near Handcross West Sussex on the south facing slope of the Sussex High Weald. The Loder Family came to High Beeches in 1849 and in the next 20 years or so greatly enlarged the existing Villa. They made money trading in Russia and would have the latest and best of whatever was then available. 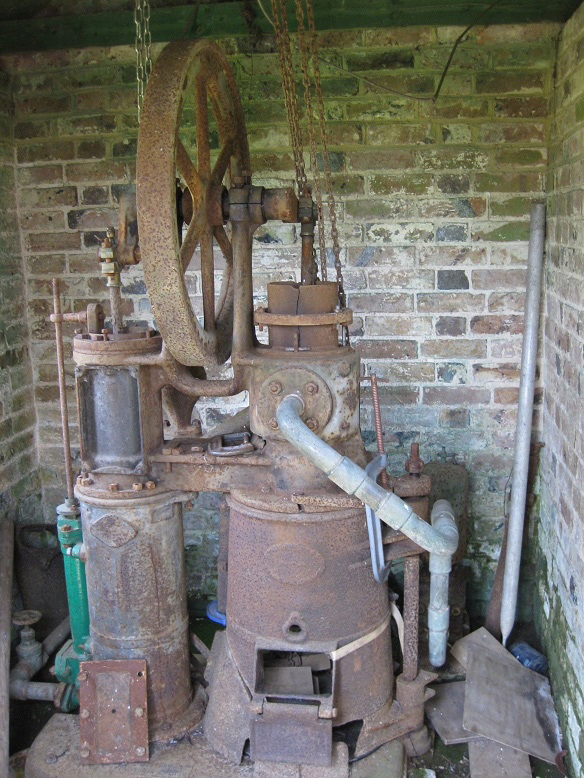 The Loders built the pump house and installed the hot air engine to supply the house with water from a pond filled by local springs. 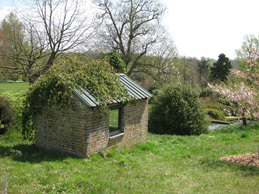 They also built the gardens which still exist today and are open to the public along with the tea rooms which offer anything from cakes to light meals. The engine was fuelled by logs cut by the gardeners and could be operated by unskilled workers from the estate. The date of installation is not known but it was certainly in use before 1910 and probably dates from 1900 or earlier. The engine finally broke down in 1926 by which time such engines were obsolete. The old High Beeches mansion burn down during the war, time passed and the pump house roof fell in on the engine, vegetation took over and it was completely lost from view. That was the situation until 1966 when Edward Boscawen bought the site of the old mansion and the ‘pleasure gardens’. Edward inherited his fathers engineering interest so he took an interest in the ruined engine house rebuilding the fallen walls and adding a new roof, doors and windows. He also made a detailed assessment of the engine which was in a very poor condition. It was always Edward’s intention to restore the engine but other things always got in the way. 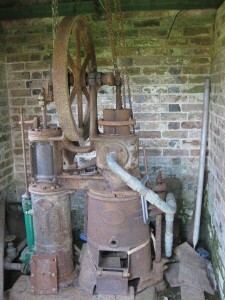 Fast forward to spring 2013 when I first saw the pump house and engine during a visit to the gardens. Feeling saddened by its condition and realising that this may be the only engine of this type still in its original situation (? ), I determined to bring it back to working order. After making contact with the Boscawen family and a subsequent meeting later that year, we all agreed that the engine needed to be restored as Edward had always intended. Thus it was that a small group of Sussex Engine and Associated Machinery Society (SEAMS) members took on the challenge. The challenging restoration story was written up over three issues of the SEM ( Stationary Engine magazine). We now have the engine running well and plan to demonstrate it running on several ‘events days’ at the gardens during 2016. 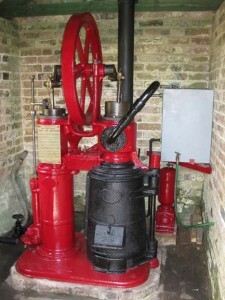 Click here or on the image to view the engine on YouTube.